Located in the heart of Stevensville, Ontario, about a half hour out of Niagara Falls is a surprising gem Safari Niagara. 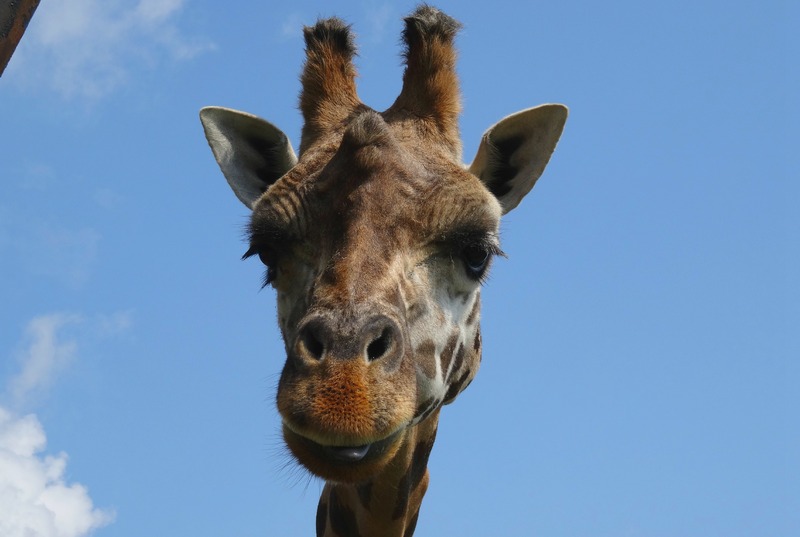 This family run park has evolved from a fathers love for animals, into a hobby farm and first opened to the public in 2002 as Zooz, it was later renamed Safari Niagara and is now a fully accredited facility. Set on 150 acres of picturesque land with much of its natural beauty intact with large ponds, woodland trails, meadows and home to over 750 animals representing over 500 species. 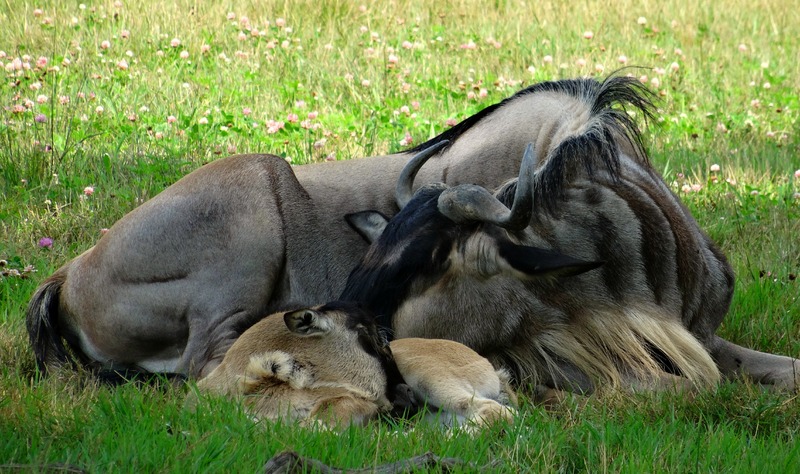 In the heat of the summer it was a great place to see how animals beat the heat at Safari Niagara. At Safari Niagara there is endless fun to be had with their rope course, bungee, splash pad and paddle boats and even summer concerts in their amphitheatre. But for us animal lovers you day will be filled with interesting creatures, sweet baby animals and lots to learn and be entertained by at their various educational shows, from birds of prey to fascinating animal antics. Safari Niagara is also home to Canada’s largest steel sculpture collection by one artist, Rod Dowling. Dowling was born in Tasmania but found his way here on the other side of the world using recycled metal to create intriguing pieces of art, many with the hint of animal in them, and around 200 of his pieces can be seen on display throughout the park. Upon entering you can opt to take the free gator tram, which will take you around the zoo with various stops to get on and off to explore or you can simply enjoy the leisurely stroll around the park’s paths. Waiting for the first show we wandered the vicinity and even caught sight of a cute, little muskrat that was hanging out with the flamingos. Through a wooded trail we took in the numerous birds of prey found at the zoo, from regal eagles to wide-eyed owls and even the jaw-dropping Andean condor. The Andean condor is one of the largest birds able to fly, at up to 33 pounds and with the largest wing area of any bird their grandness still can save these endangered birds. Only able to produce a single chick once even other year their survival rests in the hands of zoo conservation programs and captive breeding. It was near here that I met my favourite character at the park, Stanley. Stanley is a Brazilian tapir and at first was standing with his eyes drooping, looking like he was fighting off a nap, I couldn’t help but smile. The next time I saw him he’d succumbed to sleep and was laying down enjoying the shade. Located right across from the first show I decided I had to visit him again after the show and was excited to see him up, prancing around like an excited cat waiting to be fed, with his mohawk from head to shoulders erect and his snout a wiggling I giggled with delight. A keeper went in to give him some treats of succulent fruit, of which he seemed to relish and some more browse. 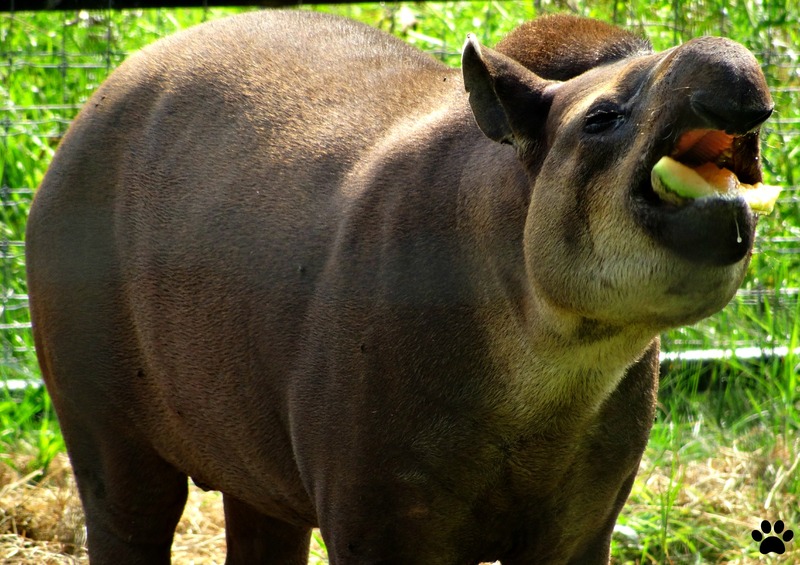 Tapirs are a truly fascinating creature and still a primitive animal that has been unchanged for millions of years. Some many think they closely relate to elephants with their short, trunk-like snout but their closest relatives are horses and rhinos. 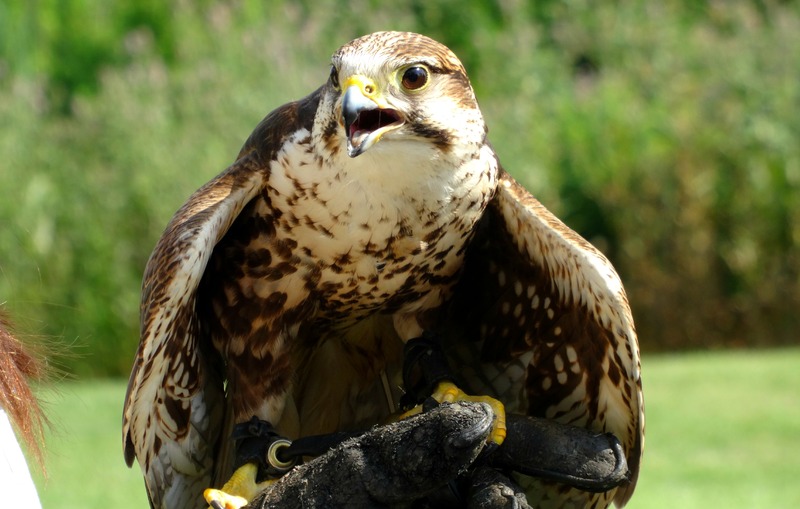 The first show we took in was the Wonders of Flight – Raptor Show, where we met some amazing birds of prey and learned about them and their awesome natural adaptations for flight. We first met Tanya, the absolutely sweet tawny owl, next was a European barn owl with its elegant beauty we were shown owls remarkable ability of soundless flight as it swooped over our heads. We also met a Eurasian eagle owl with their stunning large, orange eyes and a turkey vulture with the looks perhaps only a mother could love but such a vital part of the ecosystem. The last, and show stopper for sure, was a falcon, the astounding aerial acrobats of the skies. We learned how falconry is one of the oldest sports in the world and even saw this falcon in action as the handler swung a lure around for the bird to catch, of which it remarkably did almost immediately, and we learned how they catch their food on the wing by literally body slamming it in the air like a football player. Everyday the park offers a Big Cat Tour, which is a guided tour to see and learn more about these majestic creatures and the particular personalities of the ones that call the zoo home. You can also walk it alone and meet lions, an Amur tiger (the largest of the big cats), bobcats and a gorgeous Amur leopard which is one of the most endangered of the big cats. Also here along the woodland trails – a great place to cool down in the heat of the summer – you’ll encounter various exotic birds like the military macaw who was kind enough to say ‘hello’ to me. Don’t forget the primate trail, full of entertaining characters like the snow monkeys who were chillin’, ring-tailed lemurs performing their sun worshiper pose, rowdy black and white ruffed lemurs (to me the sweetest and most beautiful of the lemur species), spider monkeys either swinging from the ropes – all arms, legs and tails, or all curled up together for a nap, and of course the always spectacular gibbons easily swinging through the air or hooting to each other (I could watch these graceful creatures for hours). Safari Niagara is also home to musk-ox, gray wolf and reindeer. Around this area you’ll see two large exhibits where you can walk up an elevated pathway to see their inhabitants, black bears and brown bears. Everyone enjoyed watching one of the brown bears soaking in the water and playing with an enrichment toy – perhaps a tad envious as we baked in the summer sun. The white rhino was caked in mud when I saw him, another way animals stay cool and also protect their skin from the sun. Also escaping the heat were the river hippos in their massive pond, submerging most of their bodies in the refreshing water with just their eyes and nostrils above the surface checking us out. 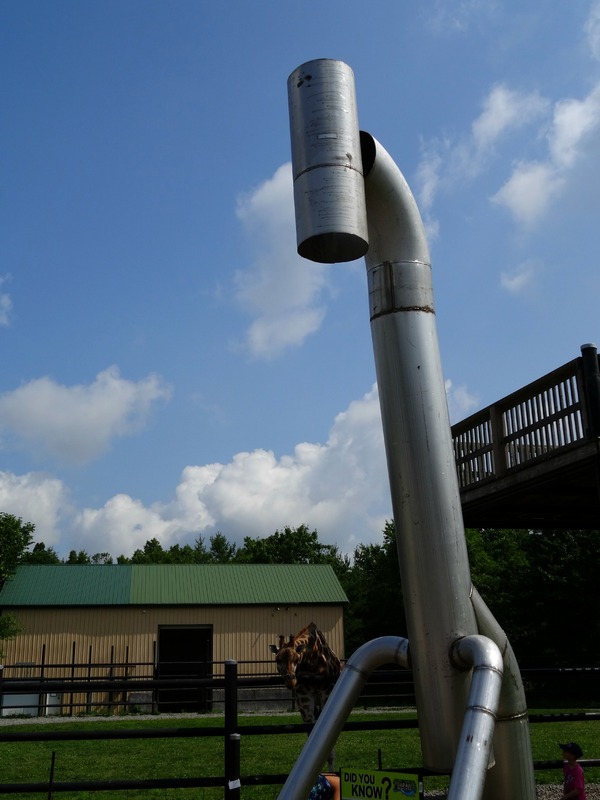 A great feature at Safari Niagara is the ability to feed the majestic giraffe – always a crowd favourite. There is almost nothing more rewarding at a zoo then to have a close encounter with an amazing animal to bring you closer to them and help develop a better appreciation for them. These guys were true gentle giants and both with different personalities and eating styles. The younger licked the pellets right out of the palm of your hand while the older one, in true giraffe fashion, wrapped his 12 inch tongue around your hand trying to get the food, of which I had to help him out by flipping my hand over to dump them on his tongue. Too cute! On our way to the next animal presentation we strolled by the marvelous African hunting dogs, also known as painted dogs for their pretty pained coats, and it was no surprise they too were beating the heat in the shade of their climbing structures, one resting its head tenderly on another’s belly and another – in pure dog-like manner – rolling around on its back, perhaps to scratch an itch or for fun as I watched it shimmy 360 degrees. Across the way was a large exhibit that was home to bug-eyed emus and a wonderful wildebeest pair with their adorable two-week old calf. A must see is Safari Niagara’s Zooniversity, a show that introduces you to some of the zoos animal ambassadors and where you’ll learn of their natural adaptations, their particular quirky personalities and how keepers work with them to keep them healthy and enriched. 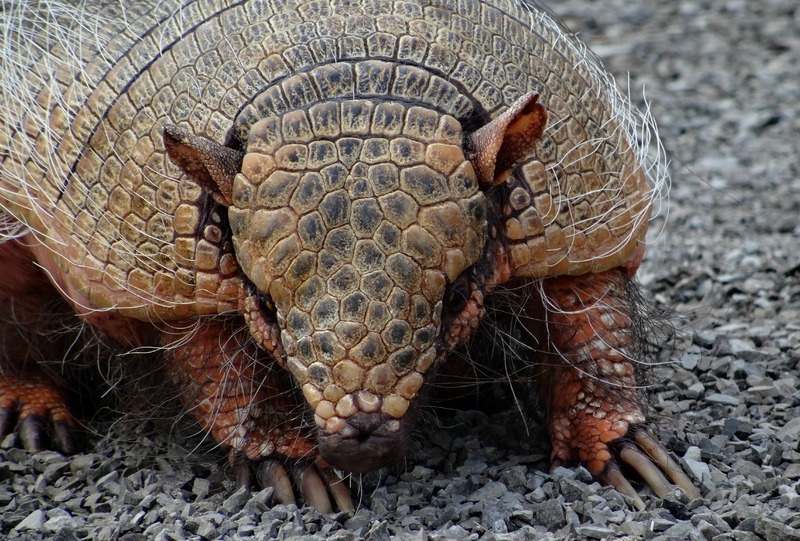 The first star was a rather chubby armadillo who waddled around and instead of turn in another direction chose to back up and proceed – too funny! There was also a cute wee opossum who delicately whipped his hands after eating and a rare sight in the daylight – a prehensile-tailed porcupine. These nocturnal creatures are found in Central and South America and with their spineless prehensile tail, that they use to grasp tree limbs, makes them perfect climbers. But the show stoppers were two brown Chinese geese who came running out waddling out after their keeper, who had raised them since hatching and who they definitely thought of as their mother. The Chinese goose is a large bird, with males up to 30 pounds and are quite prolific egg layers with up to 100 eggs in a breeding season. I was also interested to learn that people, in certain parts of the East actually keep them as guard dogs as they are quite loud and boisterous. I was pleasantly surprised by the vastness, natural beauty and amazing animals and dedicated keepers I met at Safari Niagara. If you’ve never been be sure to take in all their great animal presentations, there is much to learn and see at this gem in Southern Ontario. Wow, didn’t know about this. Have to check it out next time we are in the area. I didn’t either and is a great escape from the crowds and hustle & bustle of Niagara Falls.